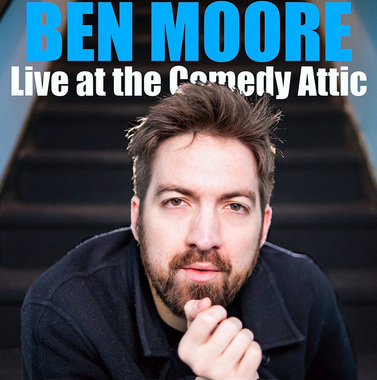 Ben Moore began doing stand-up comedy in a small back room bar packed with drunk college students somewhere in the sleepy Midwest. He's gone on to become a favorite on the nationally syndicated Bob and Tom Radio Show and continues to endlessly tour the nation's finest comedy clubs. He was a finalist in The Laughing Skull Comedy Festival and The Funniest Person in Cincinnati contest and won The Funniest Person in Lexington. He has been featured on the WGN Network and tbs.com and was a 2014 Headliner of The Limestone Comedy Festival. His first CD, "Never Coming Back", premiered in the top of the charts on iTunes; he recently made his television stand-up comedy debut on the Fuse Network's "Uproarious" and Marc Maron, on the WTF Podcast, called him a "very funny" and "talented joke-writer." We think you'll agree!